Since finding out I was allergic to red tomatoes last year , I have been looking into making things with these little treasures. All summer I had been fearing that my destructive gardening tendancies would have destroyed my little tomatillo patch out in the back 40, but I managed to save 3 plants, which to my surprise, provided me with more than enough to get me through our long cold winters here in Northern Ontario! 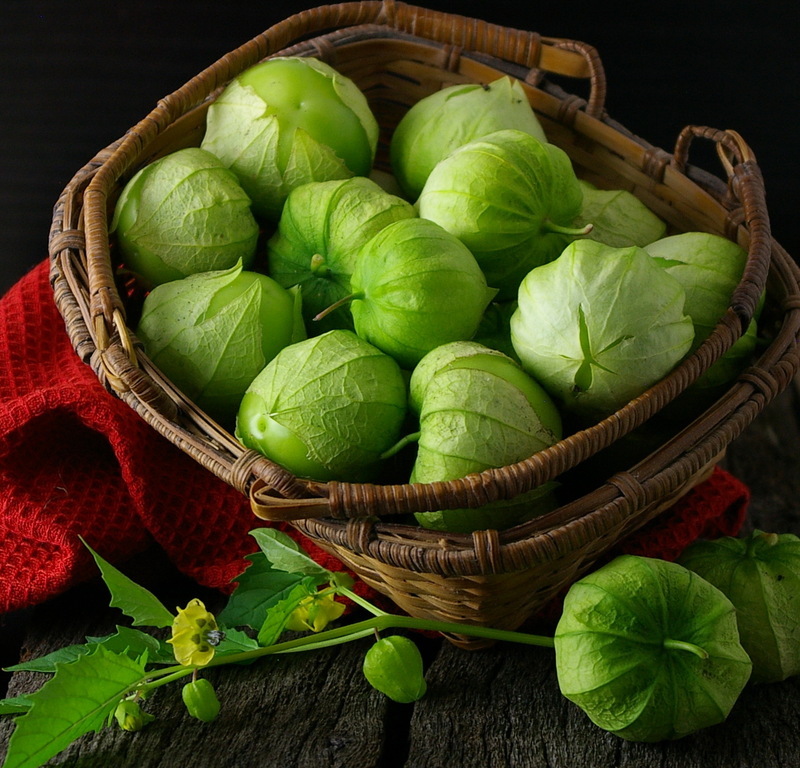 The Tomatillo is a small, spherical and green or green-purple fruit surrounded by a paper-like husk used in many Latin American sauces. I like this recipe , because it’s fast simple , and not over complicated, like so many things are these days. 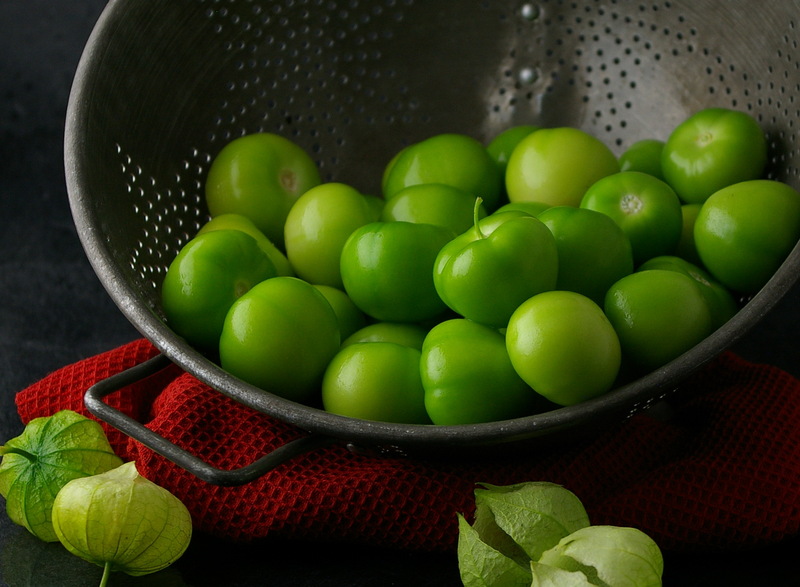 The tomatillos have a slightly sticky coating on them after you peel them , so they need a good bath before we are ready to prepare them. 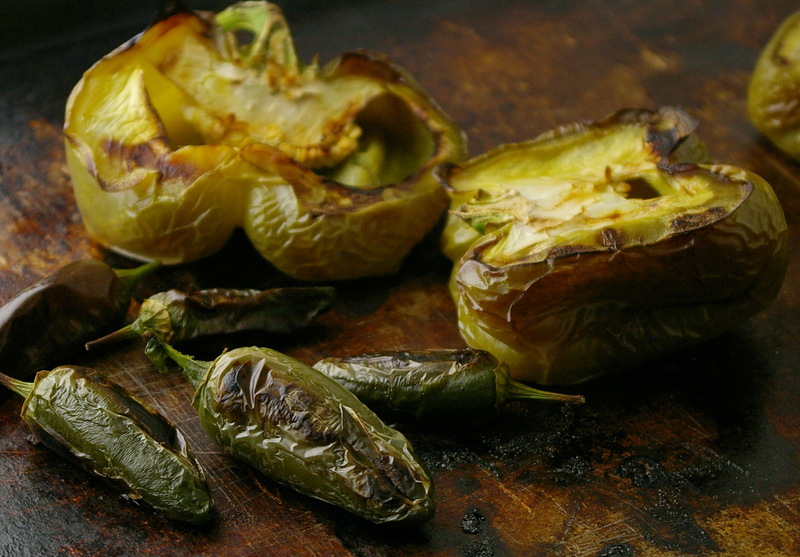 Nothing smells better than roasting peppers. I’m trying to talk John into building us an outdoor wood fired oven , but until then the indoor oven will have to do. All ready to get started now . Let’s make SALSA! Roast peppers on an ungreased baking sheet at 450°F oven, turn once until they are getting nice and dark, about 30 minutes. Let cool. You can put a stainless steel bowl over top of them while they are cooling , this will help the skin to come off easy. Peel skins off, take seeeds out and chop. In a large pot. Mix all of the peppers, tomatillos, onions, garlic, vinegar, salt, pepper, coriander , cumin, and bring to a boil, stirring often. Reduce the heat to low, cover and simmer for about 5 minutes. Uncover and continue to simmer, stirring occasionally, until no longer watery, about 30 minutes. Stir in cilantro, and lime juice, and simmer for a couple of more minutes. Remove from stove and let cool. You can bottle it up, following standard canning guidelines, or in our house, we eat it all up right away. Have fun with it . We sure do . Nothing says Party than a good batch of Salsa! This entry was posted in Dips, Home, Recipe Index and tagged Bell pepper, Coriander, Dips, Lime (fruit), Roasting, Salsa, Tomatillo, Verde by Ginger Smoothy and Otto Pilot. Bookmark the permalink. This is next on my list after I find and can some mission figs. If I can FIND me some mission figs. I live in PA but I am from Texas. I had a huge fig tree in my backyard. I can’t FIND any figs in this one horse town I live it. Sniff. 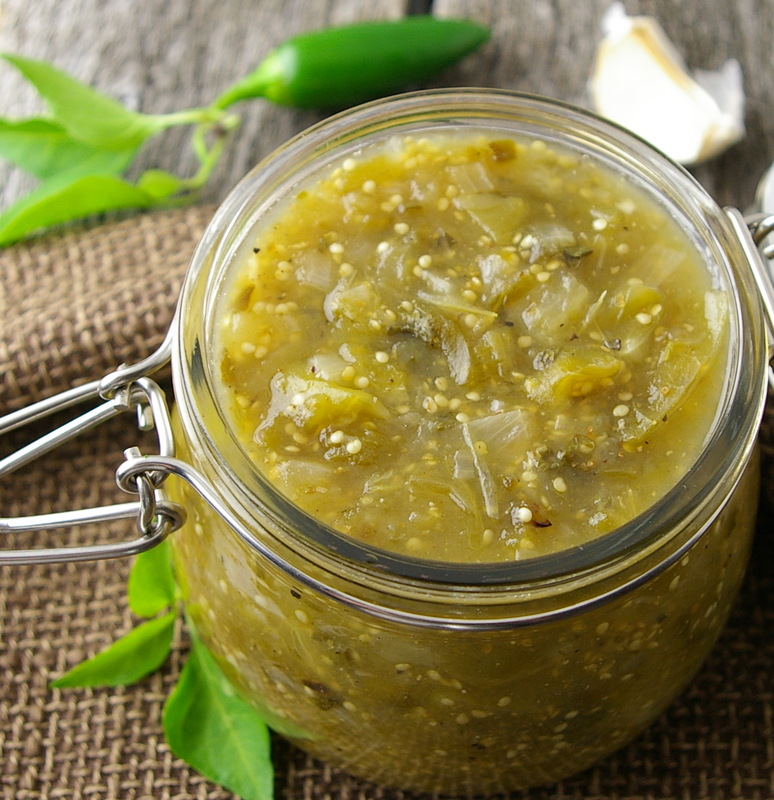 Anyway…I’ve been making tomatillo sauce for my enchiladas and roasted pork all summer long…and now is the time to prepare for winter. I know! I can buy tomatillos here but no figs! It’s funny though. No stock clerks or register clerks know what the hell they are! They always have to ask me. I see in your recipe that you skin and remove the seeds. However, I see seeds in your final product. Are those the tomatillo seeds? I usually leave all the seeds. Even the jalapeno seeds. Also, I’ve never used bell peppers in my version. I’ve always used poblanos and jalapenos. Thanks for commenting. I know what you mean about a one horse town. We don’t get many varieties of peppers here in Northern Ontario. The seeds are from the tomatillos , but I may try leaving some of the seeds in for texture and a little extra heat next time. Actually now that you said that it has got me to thinking of other ways to make this. I’ve never tried making enchiladas before, I bet coming from Texas you had access to lots of interesting food. I am going to have to start ordering pepper seeds online to grow myself there are so many varieties to try. I love them all. awsome, it’s a keeper recipe for sure. Thanks for giving it a try !